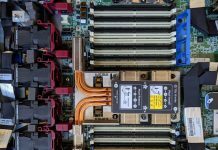 The Intel Xeon Scalable platform is headed for a refresh. Intel already set expectations about the Intel Cascade Lake-SP at Hot Chips 30 and we know it is time for a refresh over 18 months into the Skylake-SP generation. Ahead of the new chips which STH expects to launch next quarter, Supermicro is releasing new 4-way and 8-way Intel Xeon Scalable servers. The 4-way and 8-way servers will be important as combined with Intel Optane DC Persistent Memory. We expect 15.36TB of memory as a maximum figure on the 4-way Cascade Lake servers and 30.72TB of memory supported on the 8-way servers when combining DRAM and Optane DC Persistent Memory. The new Supermicro SYS-2049U-TR4 (2U 4-way) and SYS-8049U-E1CR4T (4U 8-way) are designed to allow new types of in-memory computing alongside Cascade Lake. Intel has shared this vision, along with key specs like a maximum of 28 cores and higher clock speeds in Cascade Lake-SP. We do not have pricing on the 8-way system, but the 4-way 2U SYS-2049U-TR4 if it is priced like existing systems, can be an interesting value in order to scale up and save significantly on shared components like the chassis, power supplies, NICs, storage, and etc. 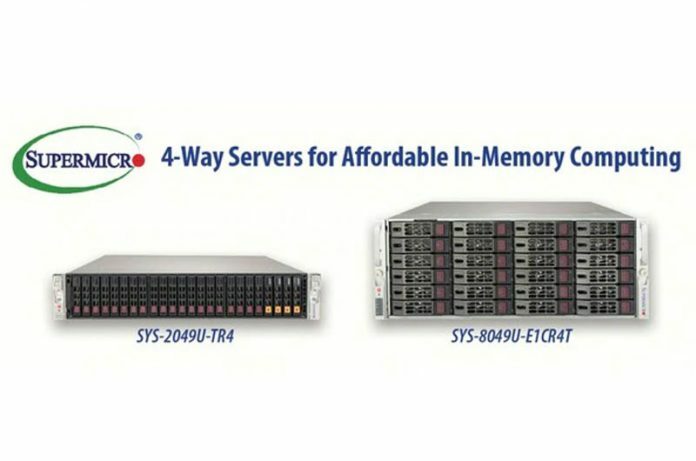 Supermicro’s list pricing has its 4-way 2U SuperServers at significantly less than double the price of its 2-way barebones servers. At STH, we have covered the new technology several times. Intel showed the modules off earlier this year to select press including STH that you can read about here: Intel Optane DC Persistent Memory Sampling Today Revenue Delivery 2018. We then had Quanta QCT leak the 3.84TB per socket capacity and Lenovo show off population guidelines and the 1.2V spec. You can read more about these modules in A Close L8ook at Intel Optane DC Persistent Memory Modules and Intel Optane Persistent Memory Looking at Green Apache Pass DIMMs. 4 EPYC’s support 16.384 TB and 8 EPYC’s support 32,768 TB or RAM. The special thing to me it the price of Optane. @Misha: don’t think that Epyc supports single servers greater than 2-way (other than supercomputers…maybe) so I don’t quite understand your point?? @Basil: You can connect 4x 2-way servers with each other via 200 Gb/s ConnectX®-6 VPI Card’s. @ Misha: There is difference between scaling up and scaling out.